A computer is necessary to modify the settings of a HVPS. 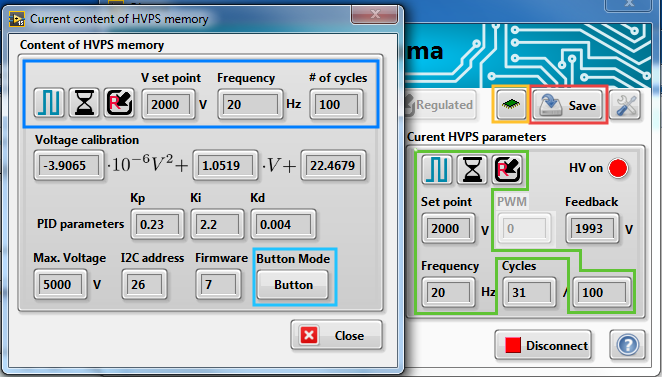 However, it is possible to store the current settings of the HVPS in its memory. Whenever the HVPS is powered up without being connected to the interface, the HVPS runs in the stored configuration. This is particularly useful for a demonstrator or an experiment that always needs the same input, as it allows powering the device without the need of a computer. On and switching mode on internal timer with a voltage >0 (the source outputs a square signal at the saved voltage and frequency). If a limited number of cycles is defined, the HVPS automatically turns off once the cycles are executed. A new series of pulses can be restarted by pressing the push button. On, with the switching source set to the push button and with a voltage >0. The button operation mode (latching/non-latching, see manual control via the push button) is also saved in memory. In this mode, the user manually controls whether the output is turned on with the push button. On, with a continuous (DC) voltage >0. The first thing to do is to set the HVPS to the desired state. All the parameters inside the green rectangle (displaying the current setting of the HVPS) are saved into memory (in this example: source on, switching, on internal timer, voltage internally regulated, voltage set to 2000V, frequency of 20Hz, 100 cycles). To check the content of the memory, press the memory button (yellow rectangle). A dialogue box pops-up, with the content of the memory. The indicators within the blue contour show in which state the HVPS starts when it is not connected to the user interface. The voltage indicator is flashing in red, because the stored voltage is higher than 0V, which can be potentially dangerous (see below). The other indicators of the memory dialogue, show constant parameters of the HVPS, such as its voltage rating, firmware version, I2C address and calibration. The operation mode of the push button (latching/non-latching, see manual control via the push button) is also saved in the memory. Close the interface and unplug both USB cable and power supply to completely shut the HVPS off. Place the HV enable switch in the off (0) position. Connect HVPS to the power supply and it will automatically load the saved configuration. HV enable switch in on (1) position to enable the HV output. If you save the HVPS in switching mode on internal timer with a limited number of cycles, a new series of pulses can be started by pressing the HVPS push button. A useful combination of parameters logically has a voltage >0. However, when a voltage >0 is stored in the memory, it can be present at the output of the HVPS as soon as power is applied (and the HV enable switch s1 is placed in the on (1) position). This is potentially dangerous, for example if a user is unaware of the HVPS current settings. Consequently, when the HVPS is not used in stand alone mode, a voltage of 0V (and/or an off state) should be saved in the memory for increased safety. Note that there are two features that should prevent shocks and/or damage to connected devices when using the memory function: the High Voltage enable switch on the HVPS overrides any setting: when it is off, there cannot be a voltage at the output. Always store/manipulate/connect the HVPS with the switch in this position. Additionally, the HV LED on the HVPS is turned on whenever the output is live, and can serve as an indicator for potential danger.